Music! What would the world be without it? Boring. Since the beginning of civilization, the human race has incorporated the art of music into various activities. When your favorite TV show is interrupted by commercials, music is always present. When you’re active on social media, music is always present in some shape or form. We even use music to celebrate birthdays and holidays. Yes, music is a big (and enjoyable) part of our daily lives. Music also plays a major role in brain development beginning at an early age. Did you know that musical instruments are said to be the best tools for developing the brain? It’s okay if you didn’t. Development of the brain begins in the womb and doesn’t stop until death. It’s been proven that children that learn how to play music at an early age are said to develop faster than children who have not. When children are exposed to music at an early age speak clearer, have strengthened social skills and adopt a large vocabulary for their age. The Novak Djokovic Foundation states, “According to researchers, the early years of childhood are critical to learn to unscramble the tones of music and to build up a mental organization system to memorize the music.” Just like language development, children develop and hone musical skills by memorizing song tones and rhythms. In other words, music is a great teacher to keep in the home when raising kids. Brain structures and functions are influenced when brain regions that are responsible for sight, hearing and movement, are used to produce music. Studies show that music training has been the gateway to better language and mathematical skills, and greater academic achievement. The differences between musicians and nonmusicians have been found in areas of the brain related to hearing and movement as well. Ever known someone that had “hearing like a dog?” If you have, it’s likely that person was a musician or music was a big influence in the development of his/her adolescence. Parents, of course, play a role in how music is incorporated into a child’s life. By starting early and signing children up for music lessons for kids, parents who do this are two steps ahead. It’s recommended that children begin music education by enrolling in lessons that are specific to the instrument of choice i.e. guitar lessons, violin lessons, and piano lessons. Change is always good and sometimes, with change comes discovering new places! Musicians in Motion is proud to announce our newest location in Waxhaw, North Carolina! The new addition to the music family is located behind the Snap Fitness (and adjacent shops) just north of downtown Waxhaw. We have chosen to focus on the south part of Charlotte and surrounding areas including Matthews, Weddington, Waxhaw, Indian Land and Fort Mill. If you or your children are interested in music lessons in southern parts of Charlotte, NC, please do not hesitate to contact us to register. Whether it’s temporary or long-term, our music lessons will help develop an appreciation for music and the arts. We believe that musical education should be an adventure and an exciting one at that. We provide a structured learning environment while making lessons fun and engaging, encouraging practice and persistence. Our music lessons are satisfaction guaranteed. If you are not satisfied with your first lesson, we will refund your money. Were you a parent who played your favorite music while your baby was in the womb, hoping they’d come into the world with an appreciation of the recording artists, musicians, and singers you love? You’ve probably heard about the studies that show the many benefits of music education for youngsters. Music seems to help with language comprehension (lyrics), math concepts (rhythm and beats), motor skills (moving hands, arms and feet to the music), and confidence for young and old alike. When, then, is “the best time” to start music lessons for your kids? At Musicians in Motion in Charlotte, we’d say you’re never too young to start. One of the main ways little kids gain exposure to music is through their parents singing to them, rocking them back and forth to the beat, and showing them different instruments in person. When your child is in their first year of life, it’s a great time to initially expose them to music. Since children develop at different speeds, you’ll generally have an idea when your child is ready for lessons. Does little Bobby bang pots and pans all the time? Does little Suzie sit at your piano and play with the keys? When you play an instrument, are your child’s eyes transfixed on it? If so, chances are your child will gravitate to a lifetime of music appreciation. Most parents seem to start their children’s music lessons between ages 5 and 12. They can have one-on-one instruction or group lessons, and oftentimes teachers make “a game of it,” to hold their attention. Some songs little kids can master singing or playing (on an instrument) include “Twinkle, Twinkle Little Star” and “Mary Had a Little Lamb.” The older they get, the more apt they are to expand their musical repertoire, and before long they’ll be in high school marching bands, musicals, and rock bands. If you think your child seems destined to play a certain musical instrument, it’s a good idea to start them with lessons for that instrument at age 7 or 8. That is “prime learning time,” when kids pick up new skills quickly. While elementary schools often teach basic music education, it’s a good idea to supplement their learning with individual lessons. At Musicians in Motion, our teachers give lessons in the comfort of your own home. Children look forward to their teacher coming over and showing them new songs to sing and play. Sometimes kids try learning an instrument only to discover they hate it. That’s fine and normal. They usually discover a different instrument soon after, and attempt to play that one. By the time high school comes around, your child will be somewhat set on what they want to accomplish musically. One of the best things about music lessons at an early age is this: your child will have a lifetime of enjoyment, being able to join music groups and bands when they’re older. We even have a local popular band that performs solely at Senior Homes. Playing music can be the highlight of your child’s life for years to come. 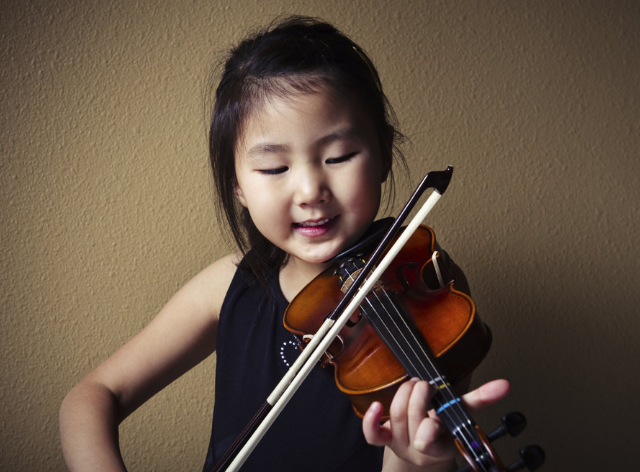 While it’s great to “start ‘em young,” any age is a good age to take music lessons. If you live in the Charlotte area, contact Musicians in Motion to see what we offer. The rate an infant changes into an adolescent is a rapid one. Children physically change at fast pace. At the same time their brain development and social skills mature. It seems easy to recognize when it’s time to teach a child to crawl, walk or ride a bike but how do we know when to teach social interaction and help their brain growth? More importantly then when, is how? Stimulating a child’s creativity has become one of the most effective ways to enhance brain growth. Whether you’re teaching him/her to color or introducing him/her to music, the benefits can be tremendous. According to an article from pbs , learning music facilitates learning other subjects and enhances skills that children inevitably use in other areas including language development and problem solving skills. Aside from the mental advantages, music also helps with social skills as well as confidence building, improved memory and teaching discipline according to SheKnows . Aside from all the development benefits, music’s greatest advantage can be teaching children to express themselves. Whether you plan on teaching them and instrument or having them sing, music in children’s life has numerous benefits that will stay with them as they continue to learn and grow.